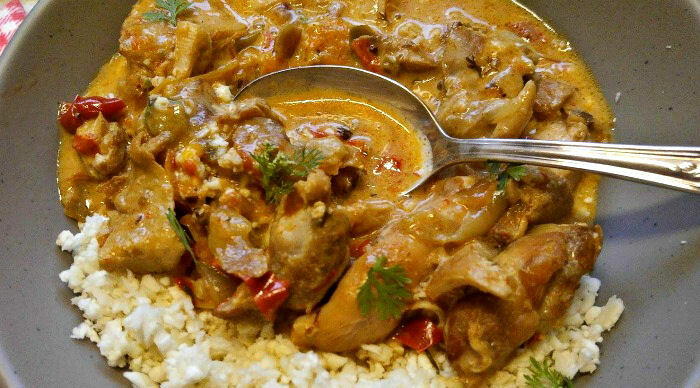 This crock pot curried chicken recipe will have your whole house smelling amazing while it cooks. Coming home to a dinner that is just about ready for the table is a treat on a busy week night! It makes a nice addition to my collection of crock pot recipes. My husband is fond of any type of curry recipe. He is British and take away curries are very popular there. I am always looking for new recipes to tempt him. If you don’t have shallots on hand, there are other vegetables that can give the same taste. These shallot substitutes will work in a pinch. I always brown my meat in a non stick pan before I add it to the slow cooker. It adds a nice presentation to the finished dish and lots of extra flavor, as well. Once the meat is browned, it goes into the crock pot on top of the peppers. One of the biggest mistakes that people make with slow cooking is to add the meat in first. It needs to go on the top, so that the juices drip down over the veggies to give them a delicious flavor. 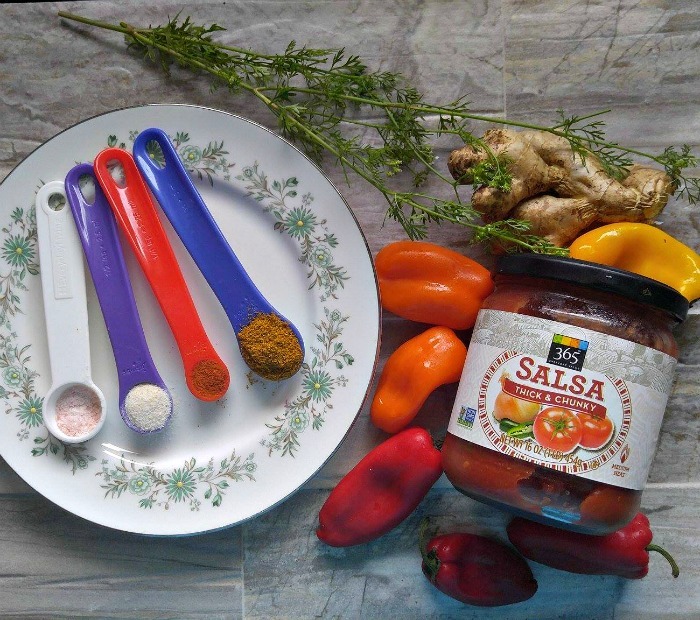 Salsa is added to curry powder. fresh ginger, red pepper, sea salt and garlic salt to make a flavorful topping for the meat and sweet peppers. It’s time to set and forget the recipe for about 5-6 hours. The final step in the recipe is to add some full fat coconut milk about 30 minutes before serving. This adds a lovely creaminess to the sauce but still keeps it dairy free. To keep this meal Paleo and Whole30 compliant, I used one of my food substitutes. I used cauliflower rice instead of normal rice. It’s super easy to do. 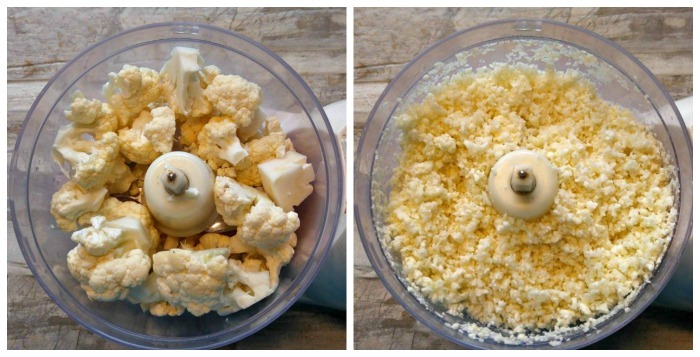 Just pulse cauliflower in a food processor and cook it gently in some oil for a few minutes until tender and then season with sea salt. 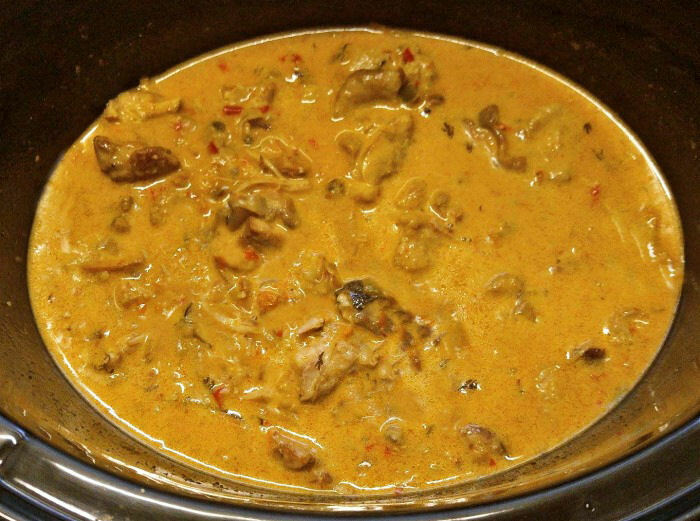 It makes a great base for the amazing crock pot curried chicken. Time to taste the curry recipe! 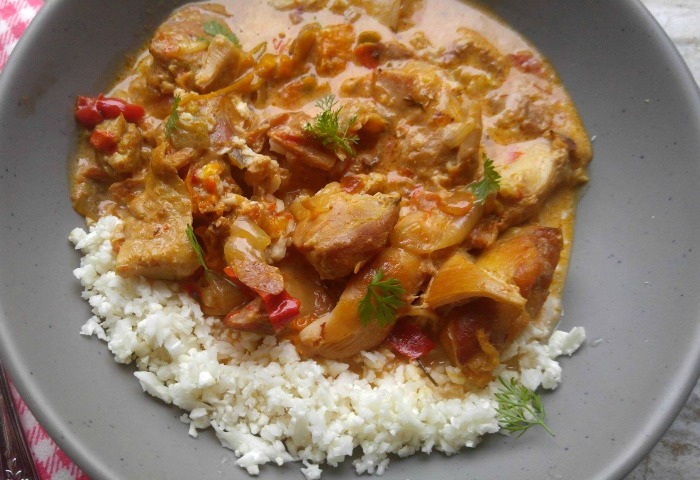 This curry is full of flavor, easy to make and gets a thumbs up from my husband. 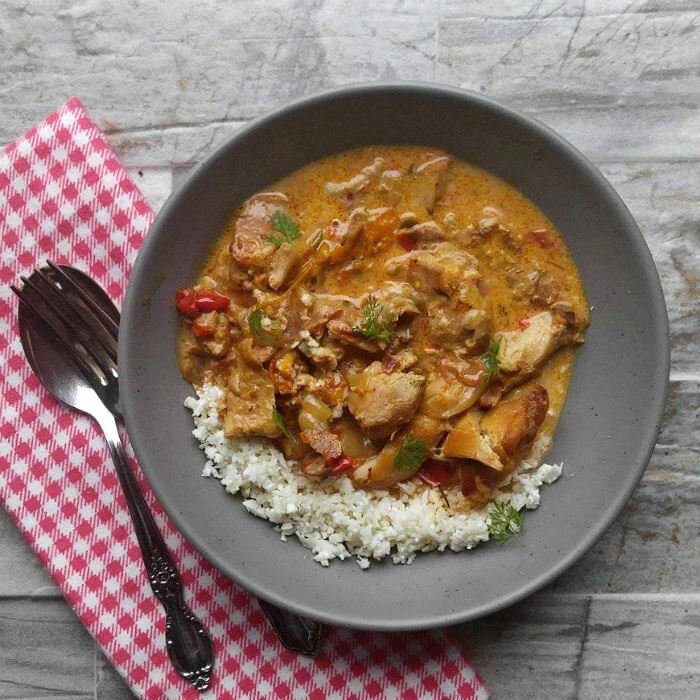 Every bite of this amazing curry will have you thinking of a trip to the Orient. It has luscious layers of flavor, not too much heat and is just amazing. 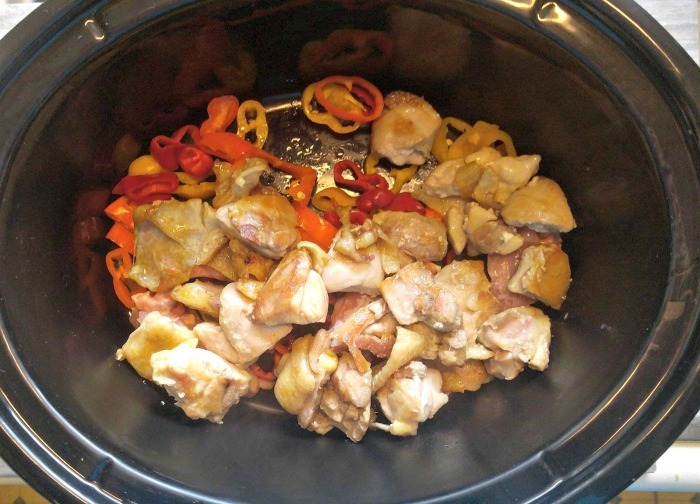 This crock pot curried chicken recipe will have your whole house smelling amazing while it cooks. 6 small sweet peppers chopped. I used red, yellow and orange for lots of color. 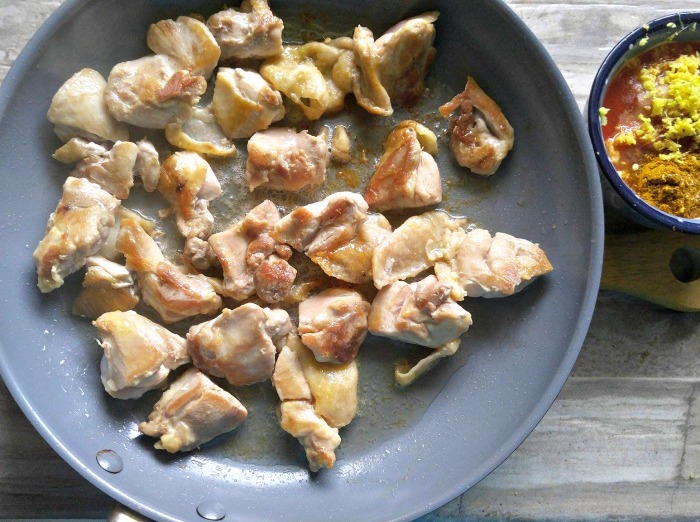 Heat the coconut oil in a non stick frying pan and cook the chicken thigh pieces until they are lightly browned. Chop the peppers and shallots and place in the bottom of the crock pot. Layer over the browned chicken pieces. 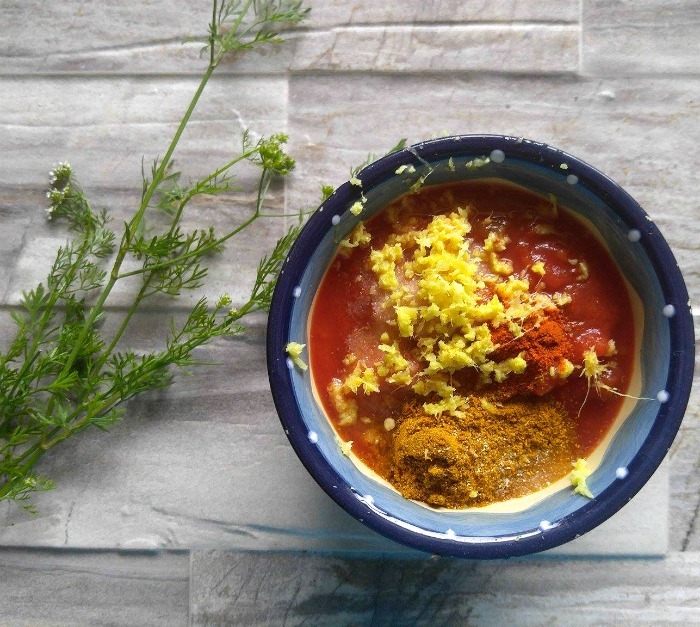 Combine the salsa with the grated ginger, garlic salt, red pepper, curry powder and sea salt. Mix well and pour over the chicken and vegetables. Add the chopped cilantro and cook on low for 5-6 hours or until the chicken is fork tender. About 20 minutes before the chicken is done, add the coconut milk and continue heating on high until the chicken is tender and the sauce is silky.